In 2014, the Japan Foundation Asia Center and the Tokyo International Film Festival (TIFF) started making a joint effort, in order to deepen understanding among Japan and other Asian countries, to introduce talents in the Asian film industry to the world, and to build networks for the future. This effort is to be continued toward the year 2020, when the Tokyo Olympic and Paralympic Games are held. In 2015, as the second year, an omnibus film coproduction project Asian Three-Fold Mirror is launched as part of the effort. 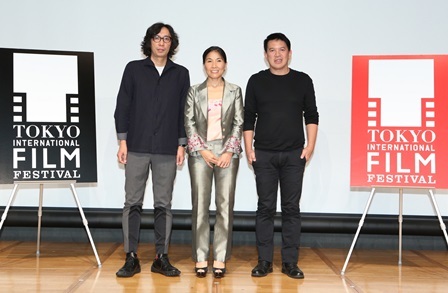 Isao YUKISADA, Sotho Kulikar and Brillante Mendoza, the three directors of the omnibus film project, “Asian Three-Fold Mirror” came up on the stage as guests and the outline of the project was revealed. Three directors will be filming it in Asian countries and the world premiere of their completed project will be screened in 2016, at the 29th TIFF. Also it is planned to be presented at major film festival around the world and to be released in Japan and abroad. For “Asian Three-Fold Mirror” we had long but fruitful meeting with these two directors. The discussion was so stimulating. In fact, I am influenced greatly by Asian films. Since I am from the host country Japan, I should take an initiative and play as a lubricant on this project. The two directors told me that they would like to shoot in Japan, so perhaps I should film in the Philippines and Cambodia. To work with different directors with different background, many challenges arise but give us a chance to learn and allow to pull something you don’t think of. So, I am thrilled to work on this. I have a great passion to Tokyo, especially Japanese cuisine, culture and Japanese films. There is something in the air, perhaps this heat makes me fall in love with Japan. While researching for the project, I found similar cultural roots between Japan and Cambodia. I see this as the fantastic opportunity to discover something new. I did some similar project in the past, and I am thrilled to work on this. I would like people to see our film, not like “which is better or not” but to see whole as one film. The Philippines and Japan have the special connection, we haven’t come up with specific topic yet but I am happy to seek more. Also, I appreciate that TIFF will show my 5 films this year in CROSSCUT ASIA section.